The company was founded in 1995 and has since grown to a reputable and experienced entity. The Environmental Services Manager is a Botanist specializing in ecology and also an Environmental specialist. Chemical and mechanical control of Alien, Invasive and indigenous plant species. Contracting works which include; Chemical weed control, Chemical growth control, Erosion control structures, land re-vegetation, tree and grass cutting in estates and or for councils. 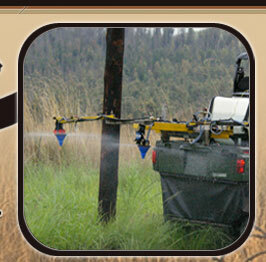 The company also supplies various herbicides. The Company is a South African rated Level 4B-BBEE Contributor, employing only previously disadvantage supervisors and laborers. More than half our employees have more than 12 years experience in the company. Therefore our employees have the necessary experience and skills required to deliver quality and professional services as required by our clients. We continuously rotate our staff between various jobs to ensure they develop and are multi skilled. We believe our success is due to our disciplinary codes and our attention to detail. The company is a registered contractor with the Construction Industry Development Board (cidb registration No. 127 830). The company has Registered Pest Control operators in employment. We also have registration with the South African Council for Natural Scientific Professions. We execute works for various Government and Para-State organizations and have a very broad client base.